Israel. It’s a word that resonates through every part of our lives, whether for its spiritual significance, its people, its history both past and present, its ongoing battles with its neighbours, the emotional energy it consumes throughout the world. We forget it’s a country and I suspect most of us have a poor geographical understanding of where it even sits on a map, let alone the significance of where it sits. I did. Until I started getting to know it. I had read enough books about Israel and the Jews and Judaism to have given myself a start. A bit of a grounding. Pick up any of the many books on the history of the Jewish people and you get a basic understanding of the complexity of this wonderful country and its people. But I hadn’t been there so it was through my reading that I started putting the pieces of the puzzle together. Hamas. The Wall. Palestinian authority. Settlements. Two State Solution. Gaza. Hezbollah. What role did Jerusalem play in all of this? All a jumble of words until you get there. In late 2012 I was fortunate to be invited to an Australia-Israel-UK leadership forum in Whitehall, London, for three days. Israel was at the core of the forum and, needless to say, all discussions were vigorous between these close countries. I was fascinated. I needed to dig deeper. It was time to go to Israel but not as a normal tourist. I found an English company called Political Tours that was running an eight-day trip to Israel and the West Bank. I could see that the itinerary was going to address many of the questions I had, without necessarily resolving them. We met with politicians from the left and the right and everywhere in between, which is one of the major issues. The media, settlers, West Bank Palestinians, religious leaders, academics — what a diversity of people we met and all in a country that could fit into the State of Victoria 11 times. It’s the David of the world — which is an appropriate metaphor — playing against and surrounded by the Goliaths. But this David has powerful friends, including the USA. The Jews in New York are rich, powerful and influential, but never underestimate the might of the Jewish diaspora. I saw first-hand the harshness of this barren land at the eastern end of the Mediterranean which has been turned into an oasis. The Jews, Palestinians, Muslims and Christians of Israel have all built this land. This is their soul. The embodiment of who they are. Zionism was the emotional pull that finally brought Jews back to their homeland, especially after the forming of the State of Israel in 1948. Brawn and brain, pride and will have created this dream come true. But the cracks on which it was formed linger on. I had received a deeper understanding and made many new friends. Just when I was looking to dig deeper again, I was invited onto the board of Project Rozana by Melbournian, Ron Finkel. When I heard the story of Rozana and its raison d’être, I was fascinated. In brief, Project Rozana is a multi-faith initiative that raises funds to treat seriously ill Palestinian children from the West Bank and Gaza at Israeli hospitals. The whole concept seemed oxymoronic in the first instance, but believable when I sat down and thought about it. At our deepest level, almost all human beings are compassionate and caring. At the top of the tree is the medical profession. Health workers at all levels dissociate themselves from the conflict that rules the airwaves and dominates the street. Project Rozana provides financial assistance in a program that takes seriously ill kids from Gaza and the West Bank to paediatric departments in major hospitals in Israel, including Hadassah’s Ein Kerem campus on the edge of Jerusalem. I joined the board. In early March this year I went with fellow directors of Rozana to see the program in action. To say I was blown away is an understatement. I was back in Israel but digging deeper still. I saw lives of youngsters from the West Bank and Gaza being saved. Back home these kids with life-threatening illnesses are doomed. Their hospitals are ill-equipped with the physical and human resources to survive the cancer of the heart, brain and other diseases, many of them genetic, that they may be suffering from. Rozana is an important link in the chain of volunteers, interpreters, and a dedicated program of medical upskilling, all of which needs a small injection of funds to make it work. 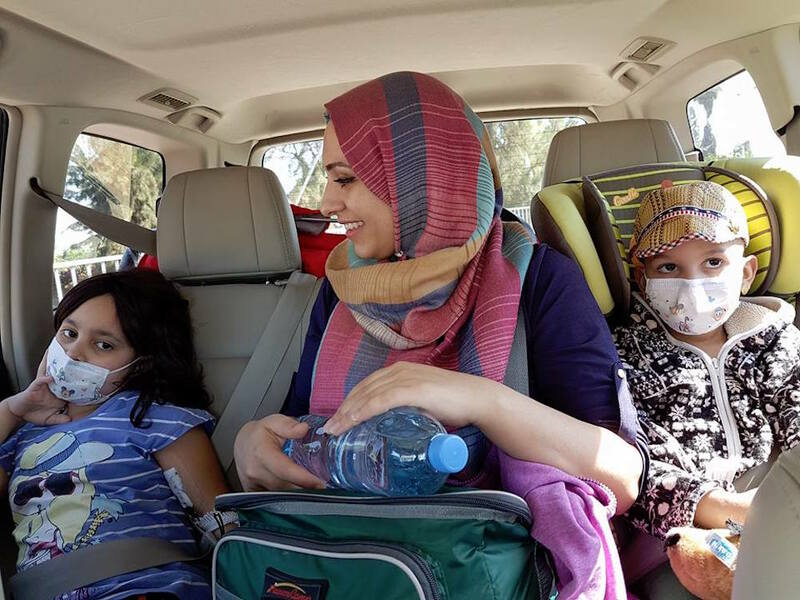 Israeli volunteers working with NGO Road to Recovery, drive children and a responsible adult from three checkpoints on the border of the West Bank and Gaza to the hospitals. They need petrol. They need other expenses. They need Rozana. As urgent as this program is to Palestinian youngsters from the West Bank and Gaza, an even more urgent crisis has erupted in Syria, and Israel is being called on again. Young children, who are living in the lawless region along Israel’s northern border, are being spirited at night to hospitals like Ziv in the ancient Jewish city of Safed, a city where the mystical practice of Kabbalah was born. Here they are treated for war-related injuries and chronic illnesses. The illnesses should rightly be treated by the family GP, but there are none in this part of Syria. If not for Israel, for its humanitarian response which informs every major hospital in the country, these children would die. So, Rozana has once again declared itself open for business. As I write, our campaign to raise $75,000 by 30 June is well underway. We have been joined by affiliates in the US and UK. I am part of a fraternal network of like-minded people who care about the fate of children, but who care nothing for their religious affiliation, gender, nationality or financial ability. I am proud of what we have achieved, and prouder still of what we are aiming to do. If you’d like to get involved, donations to the Project Rozana Emergency Syria Appeal can be made by visiting the Project Rozana website.